These are the ties of love at the 1300-year old Kanda Myōjin, which modern artists have represented as a Heart. 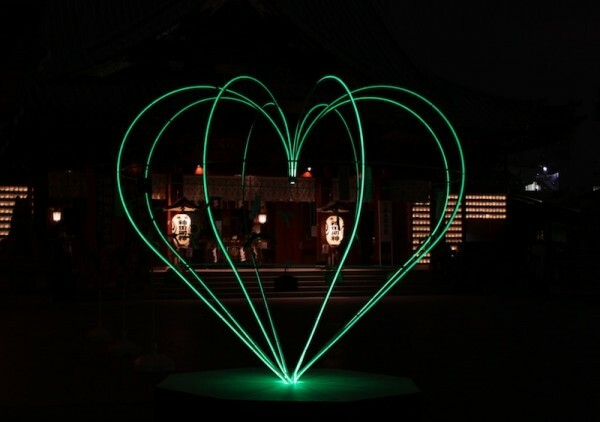 From Feb. 2 –March 14, at the public space at Saint Clair in Ochanomizu, the artwork Heart Light Go-Round, planned by the Art & Society Research Center, was displayed. It was based on an idea of artists, Shikiya Akira and Arai Atsuo of Five Senses Productions concerning love and the heart on Valentine’s Day and White Day(the day following Valentine’s Day when girls give boys white chocolate) . A 2.3 meter frame composed of LED lights and wrapped in a number of animal-like objects made of playing cards was called the “heart frame.” As a temporary work of art, the artist did not think of it as a finished work. People participating in the event tied messages on it concerning their love or thoughts for important people in their lives. These were written on playing cards of the heart suit. Only then was it a finished work. While it was a piece of contemporary art, it relied on the Japanese traditions of fortunes and ema (the pictures of horses offered to shrines in prayer or thanks), making it easy for Japanese bystanders to participate. As they looked at it, they wrote their own hopes and concerns on the playing cards that they tied on the frame. When it was finished, we had over 1500 cards on it expressing people’s love and thoughts about others. The project was a great success and many people felt sad that it could not continue. Kudō of Arts and Society had been deeply moved by reading the messages about love and thoughts about others that had been written on the playing cards and wanted to do something with them. She felt strongly about the way in which people had entrusted their thoughts as art and related to society. “This goes beyond an individual or temporary expression of contemporary art because it draws upon the context of Japanese traditions. I feel that it connects with universal and eternal expressions of culture.” We then went to speak with the president of the organization for the shops in front of Ochanomizu Station and to the conference of commercial and industrial organizations and obtained their cooperation. The provisional suppliant priest Nagasawa Takamitsu liked it immediately. We collected funds to transport it to its new location and install the LED lights. To make it a permanent installation it must be protected from water damage. We have received inititial funds from Kanda Myōjin, the local branch of Mitsui-Sumitomo Insurance Company, and the Chiyoda Branch of the Tokyo Chamber of Commerce and Industry. In 1981 , the Shin Ocha no Mizu Building with a sunken garden was established as a public space with art as a guardian deity for the area. By offering this to Kanda Myōjin with a 1300 year history, we are rejecting the usual course of making something and then destroying or throwing it away. We see the value of this project in it being a “locally made object with ties to the local area.” This will be a symbol of prayers for love for the future. We think it will represent a modern view of “Cool Japan” that is connected to traditional culture. We hope that it will become famous place that sends a message of love to foreign countries. LED full-color lights with a resin-coated special pole, a light-sensor.